It is very interesting to note various facts about the Delaware Flag, its date of adoption, its dimensions, the colors used for it and the depiction it bears. Just like all the states of the Union, the state of Delaware is blessed with an eye-catching and symbolic Delaware Flag. The Delaware Flag was adopted officially on 4th July, 1913. According to the Delaware Flag Law, the Delaware Flag is a field of colonial blue with a buff colored diamond pattern in the center. The significant coat of arms of the Delaware state is placed just on the diamond. This emblem bears the pictures of a ship, acorn, wheat and an ox. There is a soldier holding a rifle and a farmer holding a hoe. Below it is a white ribbon, which reads “LIBERTY AND INDEPENDENCE.” Beneath it is the inscription December 7, 1787, the date when Delaware became the 1st state to ratify to the Constitution of US. The shades used on the flag has to be exactly the ones mentioned by the law. As described by the original commission members who designed the flag, the tones of colonial blue and buff are representations of the ones present on General George Washington's uniform. 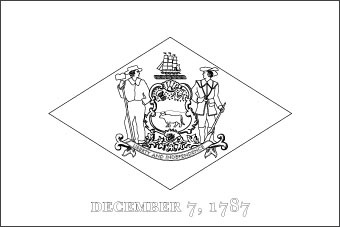 On the shield of the Delaware Flag, the ship represent the state's rich commerce, the ox, acorn, wheat and farmers represent farming and cattle ranching. The soldier on the Delaware Flag pays homage to the Revolutionary War Soldiers. There are certain historic facts depicted on the Delaware Flag, like the date on which it became a official member of the Union. The remarkable symbols and bright hues enhance the beauty and appeal of the prominent Delaware Flag.